The CBC 5ft 8" soft deck surfboard is perfect for the young beginner. Its manageable size with durable and stable platform, makes it great for the smaller person, yet still has enough width and float, and is great for even the budding shortboarder. The board is made of a heat laminated high density waterproof EPS core with three multi-layered (moulded-in) laminated wood stringers, this ensures to keep the board stiff and resist warping. It has a professional high density polyethylene slick bottom, and high density durable IXPE/XPE deck. This Sushi surfboard has a safety Tri-Fin system with nylon screws, this allows for sharper turns, while a more spread out configuration increases stability. It comes complete with a double swivel surf leash with rail saver, and neoprene padded ankle strap. With a fish scale deck graphic, this is a cool and colourful surfboard. The CBC Sushi surfboard is the perfect surfboard for both beginners and more experienced surfers looking to have some fun this summer. Available for in-store pick-up from our Vero Beach and Stuart stores in east central Florida on the Treasure Coast (specify during checkout). If you select the Stuart store, the board will be available the following Thursday. Vero store will be available immediately. Please email us at info@deepsix.com or call 1-800-732-9685 if you have any questions. Free XM tangle-free leash if you purchase online (online orders only). 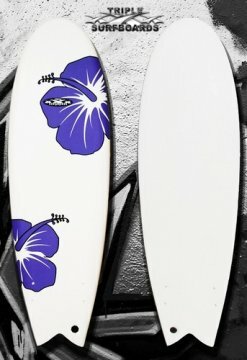 Channel Islands board designs are direct results of team feedback, so when Dane showed up at the factory in early 2010 requesting a short wide epoxy with single concave and a huge square tail to make the summer bearable, the Dumpster Diver was born. When he came back a week later and wanted one with a narrower nose and a Rookie tail template for the Trestles contest in 3 days, the 2nd Generation Dumpster Diver was created and remained under his feet all the way through to his first final at the WCT Trestles 2009. 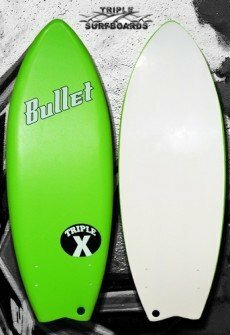 Voted SIMA board of the year for 2010.
â€œThe Fred Rubble is actually quite a bit different than my other boards. It has a lower entry rocker and a wider outline. It has more volume than a Proton, but it isnâ€™t really short and chunky like a Dumpster Diver. Itâ€™s just a fun board for waves from waist high to a little over head. Iâ€™ve been riding mine two inches shorter than my standard shortboard and 1/4 inch wider. For example, my standard shortboard is a 5â€™11″ x 18 3/8″ x 2 3/16″ Proton and I ride my Fred Rubble as a 5â€™9″ x 18 5/8″ x 2 3/16″. Rob Machado wanted to bridge the gap between his Biscuit and Gravy, the Motorboat does that. Low entry rocker along with single to double concave with vee make this board really motor. Super fast and fun in flat faced waves, the Motorboat blends performance and volume into the ideal small to medium wave performance board. Motorboats are built with either â€œGreenfoamâ€� or recycled EPS, UV cure resins, and recycled fins, as Rob also wanted to make the Motorboat less impactful on the environment. A limited edition run of 75 boards signed by Rob are planned to have foam waste combined with concrete for water fountains commissioned by Robâ€™s foundation for schools. Should be ridden approx. 4 inches smaller than your shortboard. Knee to slightly overhead, novice to advanced surfers. Available for in-store pick-up from our Vero Beach and Stuart stores in east central Florida on the Treasure Coast (select during checkout). If you select the Stuart store, the board will be available the following Thursday. Vero store will be available immediately. Please email us at info@deepsix.com or call 1-800-732-9685 if you have any questions. The 2012 Neckbeard tail is taken directly from Daneâ€™s hand-drawn template. Dane kept the overall generous plan-shape to provide a skatey feel but the tail refinement allows for slightly more back foot sensitivity. Light single concave and vee out the back, increased rail-to-rail transition and wider through the nose and tail. Coming to stores April 1st, 2012. A global favorite for punting since 200t the Pod is built to fly. Deep concaves with a foiled nose and a swallow tail keep the Pod lively and maintains its high performance. The â€œsnubâ€� nose puts volume forward, allowing for maximum planing and wave catching. The wide, curvy outline makes the Pod friendly for all levels of surfers. Ride this board 6″ to 8″ shorter, about 1 1/2″ wider and about 1/8″ thicker, about 3″ to 6″ shorter than you are tall. Punts, turns, you can do it all. A summer favorite. Measures 5' 10" x 22" x 3"
Board Dimensions: 4' 11" x 21 x 3"